It's Spring and Mother's Day is only two weeks away, but I just can't seem to get the "Seven Swans-a-Swimming" Christmas lyrics out of my head. Perhaps, due in part to this snapshot that our night Baker captured two weeks ago and also in part to their debut in our store nearly everyday since. We made them as a special order, but they sparked such an interest that they have earned a spotlight in our refrigerated case. Made simply for the desire of one customer, now over 100 swans have went a-swimming. What a chain reaction! Cream-Puff Swans were once quite popular for weddings and sweet table buffets because of their "wow" factor. Today, Mother's Day brunches seem to showcase these delicate creations. 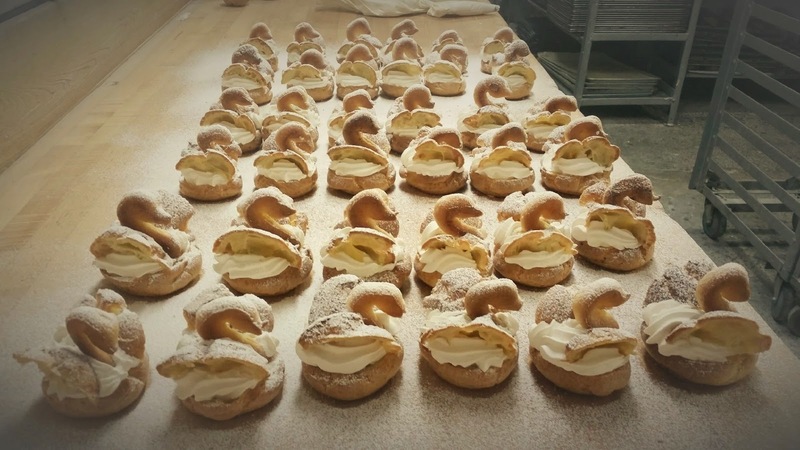 At Haegele's, we haven't made them in years, but thanks to a long time customer and our desire to please, a delicious flock has taken up residency in our bakeshop. Whether our customer knew it or not...she had "swimmingly"perfect timing with her request as Mother's Day approaches.